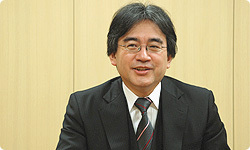 How would you describe New Super Mario Bros. Wii to the people reading this interview? I'd say that we’ve come up with a title that everyone, from those who are not all that skilled, right through to those who are highly-skilled, can all enjoy the fundamentals of Mario games. I think it boils down to that. You just said that in quite an off-hand, casual way but achieving that must have been an incredibly difficult task. 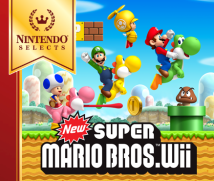 My aim was that the Wii version of New Super Mario Bros. should still be selling copies a year after its release, just like the DS version did. I wanted it to become a staple for Wii owners. I put an enormous amount of energy into achieving this. What do you think the difference is between titles that continue to sell even a year after their release and titles that don’t? It needs to be full of things to discuss. Right. It's important that the other person knows what you're talking about, and that you're discovering new things. That way, even if you play for a while and then put the game away, when a friend comes round, you'll want to dig it out again and play it again. I also think it's incredibly important that the sensation of playing the game is one you can't forget and that it gives you something that you can't get from other games. I suppose you'd call that the atmosphere of the game, or the "smell"... I think "smell" is getting close to it. Well, great movies have their own distinctive "smell", don't you think? And I'm not talking about the smell of the cinema either! (laughs) There'll be a particular "smell" that you get from certain images. I think that when something summons forth a lot of emotions, what you feel is perhaps something like a "smell". I wanted to make Mario so that it had its own distinctive "smell" - a Mario-esque "smell". I wanted to create something that stimulated as many of the five senses as it could. If you can do that, then when you get the game out to play from time to time, it really makes you happy. There are those games that you might just give one quick go but don't tend to really stay with you, no matter how exciting they may be. Today you've used the expression "smell". But you often also talk about the particular "feel" of a game. Where do you think the particular feel of a game comes from? What would you say gives a game that Mario-esque feel? Well, depending on the game, you might use a joystick or the +Control Pad. In any case, the hardware functionality is identical. However, depending on the game, the actual feel when you press a button differs. That's the important part. It wouldn't be true to say that the controls for Mario have been handed down from generation to generation at the company. In actual fact, we have to redo it for each and every game. 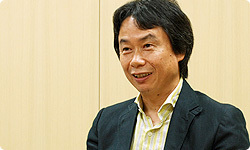 But in the end, your own personal sensibilities will be the decisive factor, won't they, Miyamoto-san? I'm sure you're looking at the past through rose-tinted spectacles! (laughs) That "feel" you're talking about is something that changes in step with the times. It isn't something universal and unchanging. You're right about that. And add to that the fact that now we can see things in incredibly fine detail. In the old days, you would fill in the detail yourself using your imagination, while nowadays you can actually see all that fine detail… But it's not necessarily the case that, just because something has been made with attention to the fine detail, it's actually always better. If I may make a bold distinction, I'd say that there are times that encoding and simplifying something makes it easier to understand, while there are times that expressing something in very fine detail is more pleasing. That variation is important, isn't it? The same is true of audio. It's not the case that you can use nothing but sampled sound effects. With Zelda, when we only used a sampled sound effect for the rumbling of rocks, that made it feel incredibly real. You really pay a huge amount of attention to sound effects. Perhaps that's because they can have an impact on the "feel" of the game. Right. Sound effects are extremely important to me. Take, for instance, Propeller Mario who appears in this title. I thought there was something odd about the sound of the propeller and asked the staff working on the audio side to fix it. But this seemed to cause them a great deal of trouble. They weren't sure how to fix it? So I explained to them: "Try to make it sound like a beetle flying!" The staff didn't have a clue what to do anymore, so I asked them what the propeller was made from. You asked what raw materials the propeller was made from? Well, of course a suit with a propeller attached to the helmet isn't something that actually exists in the real world! So I asked them: "How is this powered anyway? Is it an engine or a motor?" They told me that there was no way they could possibly answer that. Then I say: "But if you had to choose one, would you lean towards it being an engine or a motor? Or is it some kind of hybrid?" So you would keep asking them again and again in order to try to get the right sound to fit the image you had! If you don't settle on a fixed sound, you won't be able to tell the difference when the propeller's turning slowly or quickly. After I asked about it so much, I realised that whatever was powering this propeller would be pretty heavy, so I said: "Don't you think it would be best if Mario's neck was tilting a little?" Creativity that comes from letting things take their own course! (laughs) Out of interest, what did you finally settle on for the sound of Propeller Mario? propeller with a whirring sound .